Nelson MandelaIn 1942,Nelson joined the African National Congress (ANC), which, at the time, was polite to the government. Soon Nelson Mandela had persuaded the ANC to use boycotts and strikes against the government instead of being polite. He was arrested for civil disobedience, and was not allowed to attend gatherings. 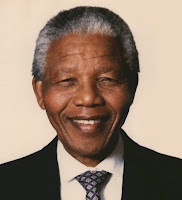 In 1993, Nelson Mandela shared the Nobel Peace Prize with F.W. de Klerk forAfrican Flag dismantling apartheid, and in 1994 he became the first democratically elected South African president. Nelson Mandela loves koeksisters and coke. He loves singing and was one of the people who organised concerts in whilst in jail. Nelson Mandela is an amazing and inspiring man for millions to look up to. These are just some of the basic factsabout this exeptional man. Mandela came to my school once and talked to us. It was undoubtedly the best speech I have and probably will ever hear in my life!! This is truely a great, great man. well id like to know if and when he died because i use this for a school project!! This site is very useful as i have writen an extra 2 pages in my school project. I highly recommend using this site as it has very precise information. Also RE: the comment above: no Nelson Mandelas hasn't died yet. Nicki mr. Mandela is alive, check your facts before you post things up. wow he's very interesting.i might even be the president of south america.i wish he was in my family he would give me lots of money. Nelson Mandela is fit. And i like his fashion sense, yumm! (lawyers are not known for their religious tendencies)also his jail no was 4 666 4 but is always pronounced four double six,six four! Why not four triple six four(4 666 4)any connotations? i think that this man is a great example to what the world should be like today- rasism is wrong and Nelson Mandela is a grreat person! Nelson was a brave man and everyone should follow in his steps. A true Legend who is an inspiration to all. Selfless and forgiving and gives hope that we can live together if we choose to accept, respect and be willing to share with each other the resources bequeathed to all mankind natually. BRAVO SIR NELSON MANDELA, you are my hero!!! did anyone else think he was a basketball player? INCREDIBLE WHAT HE HAD DONE!!!!!!!!! His parents named him Nelson because they thought the name sounded "white". They were hoping that with a name like that, he would not have to face as many hardships as other blacks. BTW to the person who was a bit rude to nikki, you are wrong because she said IF and when, she never said that he had died! you need to read peoples comments before you be rude about them! Good man...Our grand father,spent a lot of time with him during his spell as a president when he would visit Qunu. Nelson Mandela gave up nearly gave up his entire life just so people would get treated the same way i think he is the best man ever to live except from Jesus Christ himself. maybe he doesnt know him, but that doesnt mean he cant say his opinion..
the legend of zelda is awesome!! fair play Nelson Mandela is a good man and always will be. Doing work on him in school and never ever had a better project in my hole childhood! nelson mandela was a truly faithful man who put his trust in God. that is why he was able to do these things.God is great, God is great, God is great. This has some very interesting facts in this post, that I didn't know about. I believe that Nelson Mandela was such an amazing man for virtually stopping the apartheid. Heaps of people look up to him, now I know why. Nelson Mandela definitely changed South Africa for the good of the people and he was never selfish, he always thought of everyone but himself. Nelson Mandela was nothing but a terrorist who wouldn't stop until he got his own way. Why give praise to terrorists?